Walk through the complete development process in this session that draws on real-life examples. Topics include site selection, project size, land costs, facility design, unit mix, engineering and more. Walk through the complete self-storage development process in this session that draws on real-life examples and a series of insightful "what if" scenarios. You'll learn how to use assumptions to make decisions regarding project size, land costs, facility design and construction. Our presenter will discuss single-story development, multi-story buildings and "big box" conversions. 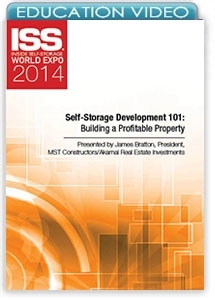 Attendees will walk away with a firm grasp of what they need to develop a profitable self-storage property.